Lately I have been loading up on armfuls of freshly yanked ruddy beets sold in thick bunches by the Guillon family, who have a goat farm in Rontalon about 18 miles outside of Lyon. One thing to do with them is a little millefeuille de bettrave that incorporates their generous offering of chopped home grown herbs in their fresh farm cheese. Pipe this in between layers of these beets, and finish with a cold sauce using hazelnuts and either watercress or arugula with a nice green olive oil base. I do this in some form every year when the beets are just throwing themselves at me like they are now, alternating the greens as weeks flow by with similarly good results. The last time I did this dish with students, I was setting up my work stations and realized that my hazelnut supply was gone. Sometimes little kitchen trolls gobble them in the night, it must be noted. I could have gone out on a wild goose chase for hazelnuts in the neighborhood, wasting the time I had set aside to think, or I could toast up some almonds. After we popped a little amuse bouche involving puff pastry we'd folded and rolled ourselves, we plated and served our millefeuille de bettrave. I tasted the sauce with almonds and was taken with that feeling of joy that comes when the resonance of flavors hits just so. I immediately marked this down in my kitchen notebook. You should try it with almonds too. This recipe is very flexible, and should be adapted to whatever fresh herbs you have available to you. What you want to take from this recipe is the thought, the reflex, telling you that you can do a salad like this with just about anything. 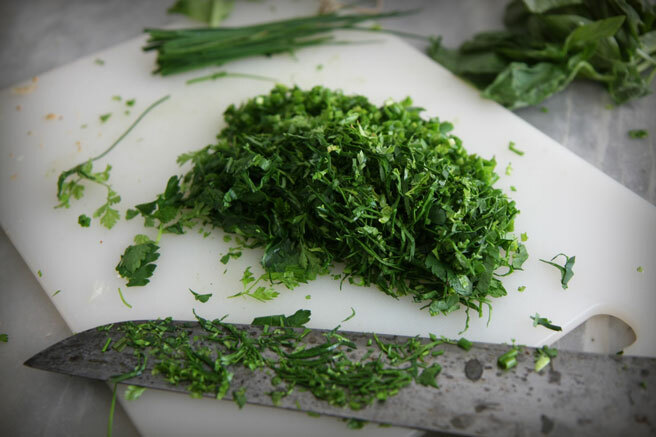 The one thing to keep in mind is that for your sauce, you want something with a little bit of spice, like watercress or arugula, and for the little puffs of creamy filling, use the classic mix of fines herbes (chives, parsley, chervil, and tarragon), avoiding heavy doses of strong flavored aromatic herbs that don't work well in groups. -Note about the nuts and nut oils: If you're using walnuts, why not also add a little walnut oil to your sauce? Same goes for pistachios, if you keep these oils in your home, try adding a little bit to your sauce. It has a really nice effect. 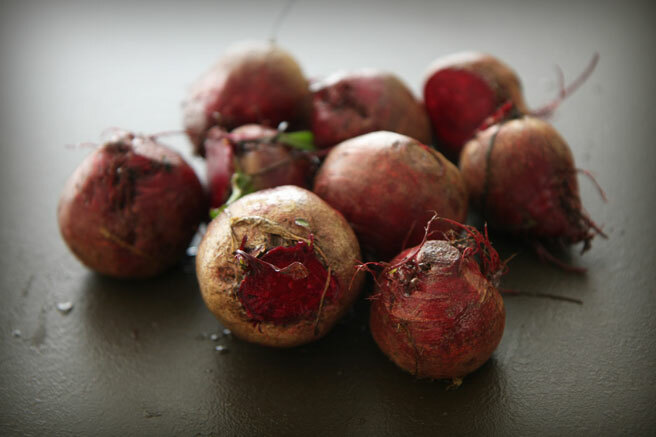 - Steam or boil the beets and transfer them to an ice bath, then slip the skins off. Doing this in the water helps keep things cleaner in my experience. Slice thin. - Mix the cheese, the herbs, and the nutmeg, adding cream if the cheese you have is not creamy to your liking. Add the olive oil or mixture of oils, stir until smooth, and season with salt and pepper. 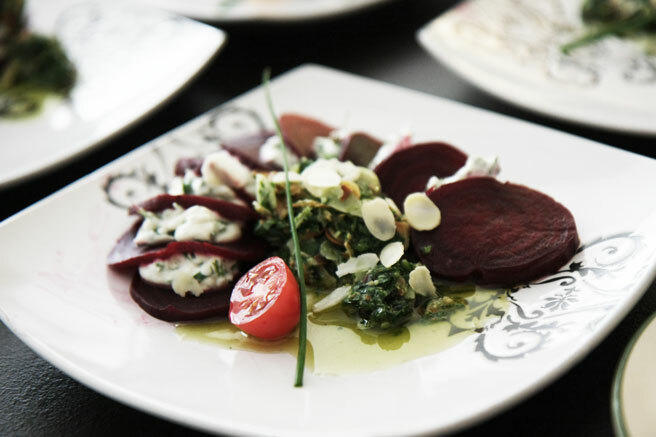 - On individual serving plates, make stacks starting with a slice of beet, then the seasoned cheese, beet then cheese, ending with beet. You can experiment with how you like to stack your mille feuille, either doing it in a more 'classic' way, straight up in a pile, or stacking it along like dominoes, turning it into a generous salad-like heap if you plan to make this a significant part of your meal. The point is layering the beets and the cheese, really. - Toast the nuts in a dry skillet over medium to high heat, until they begin to brown and release their aroma. Transfer immediately to a cool plate. - Make the sauce by blending, crushing or pulsing the greens, oil, garlic and 3/4 of the nuts. 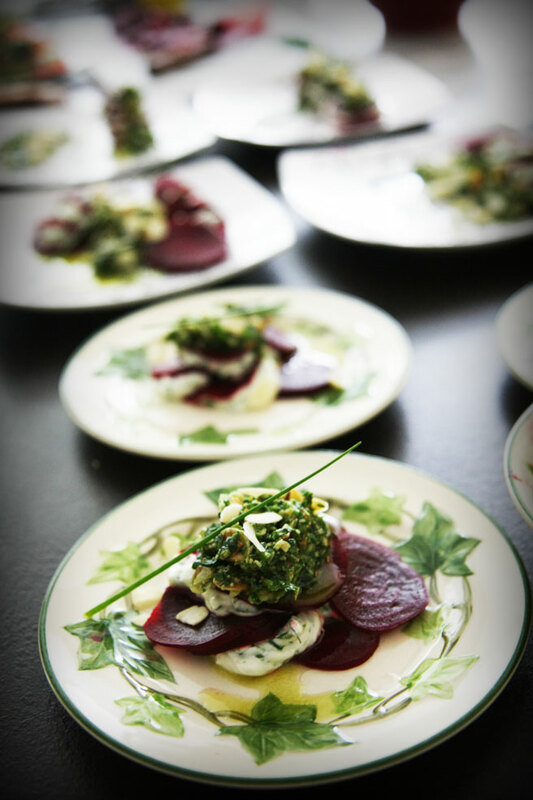 - When plating, drizzle the green sauce on the stack of beets and herb enriched creamy cheese and also on the plate, adding droplets of good green olive oil as well. Garnish with fresh herb leaves and sprigs, and slivered or crushed almonds. OH, GOODNESS!! I can taste those earthy beets and those herbs right now. Except, I must confess, I cannot remember having tasted sorrel, ever. Perhaps in the great handfuls of the unknowns from my Mammaw's bed of ancient plants. Just lovely, as always, Lucy. And I love that you write in such a contemplative fashion, as if savoring the words themselves. Perfect! I have beetroot in the fridge and need a starter tonight. I love it when a plan materializes! This looks divine thank you- can't wait to try it! Lucy, these pictures are absolutely beautiful. Who could look at these and not want to devour every last morsel? Looks a lovely recipe. have you thought of baking your beets. It seems to concentrate the flavours and sugars. Bake in a hot oven until a skewer slides easily into the centre of the beet. Then refresh as per your recipe and slide the skins off. Roasting is a great way to do the beets, we also can buy them pre-cooked at many outdoor markets here. This can be done with any cooking method. I know someone who likes his beets raw. But that's kind of special. What a delicious looking plate! Such freshness! What a creative take on a mille feuille presentation, which I've only seen in awkward, (but beautiful) stacks. This is so lovely and laid-back, lol. A really impressive looking salad, thank you. The longer people stretch from the classic feuilletage the less rules there are. These days thin slices of anything layered, dominoed or fanned are fair game. Do you remember the nastiness of canned beets from our youth? What a revelation fresh beets were to me! This looks lovely and delicious! Mouth watering photos! Any suggestions on beetroot in sweet dishes?